Animal prints seemingly won’t disappear. 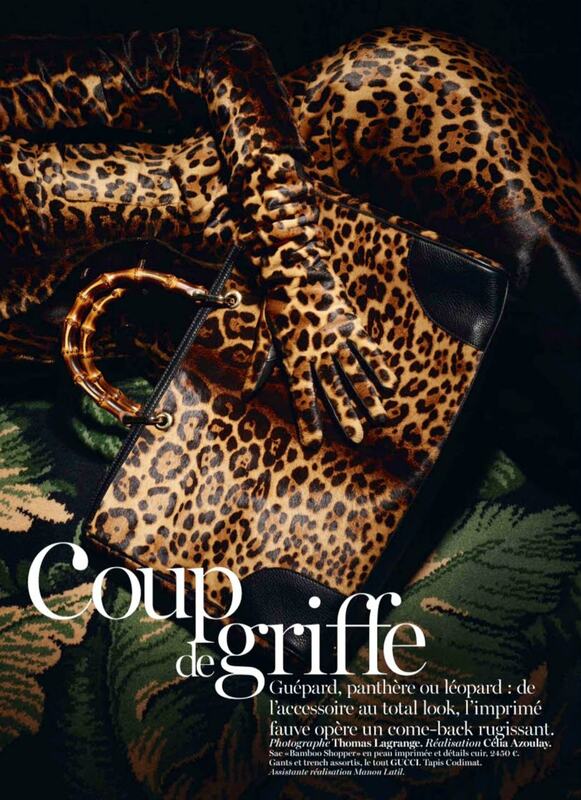 Many leopard and jaguar skin items, such as the Gucci tote featured above, are stylish pieces that have been on trend for a long time. Gucci are always on top of recent trends, and it looks as if this bag is another winner. This tote design combines leather animal prints with bamboo handles, which gives this piece a very exotic feel. The photo is nicely taken by Thomas Lagrange, with the handbag upon a rug displaying large bushes. The picture really offers a great artistic impression, suggesting that owners of these bags will fit as seamlessly into the backdrop of society as a jaguar does in the wild. The bag is relatively well priced for a Gucci bag, coming in at approximately $3200. Previous: Trend Report | Moschino and Miu Miu. Romantic Red..
Next: Trend Report | Dior Sunglasses. Autumn-Winter 2013 Sold Out!..